Are you a fan of the faith-based movies Fireproof or Courageous? Well, then, Altar Egos is a recently released Christmas movie that you are sure to like… and it’s a comedy! Altar Egos stars Robert Amaya as Pastor John, and Erin Bethea as his wife Betsy. Robert Amaya played Javier Martinez, the homeschooling dad in Courageous. Bethea made her feature film debut in the lead role of Catherine Holt in Fireproof. Pastor John takes over the local church after his father dies. Determined to see the church grow, John does the unthinkable and wants to change the Christmas pageant that they’ve been doing for 30 years. This inflames Mary, the choir director, and provokes a choir protest. 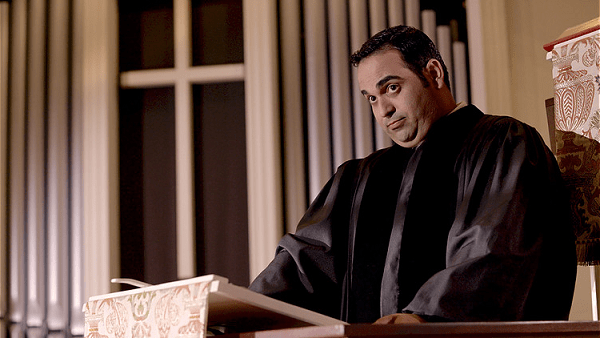 Pastor John is desperate to reunite his church or else he may face termination. With the help of his teenage son, Pastor John disguises himself as an old man to bridge the generation gap, win over Mary, and get the choir back. But when he realizes there are deeper wounds within the congregation, he must learn to love the unlovable or risk the ruin of his church and family. I’m sure most church-goers will find something in this movie that they can relate to. Although the characters aren’t very well-developed and they’re more like superficial caricatures, I bet you’ll see at least one that you “recognize” from your own church. The movie is realistic in that conflicts within the church can be contentious, and people can be hurtful without meaning to be. The truth is, those who hurt others are often feeling hurt themselves. So you’d be wise to be mindful of people’s hidden pain. If you’re not sure what the person’s problem is, do your best to give them the benefit of the doubt. Altar Egos is a humorous movie and yet it has a serious message. This movie reminds us to treat everyone with kindness, respect, and love. It’s important for people of all ages to try and get along. But the old adage of seeing things through each others’ eyes works both ways. While we need to respect our elders, I also think the older members of the congregation should be less stubborn and more open to new ideas, if they want their church to grow and not die out with them. Buy or rent digitally at ChristianCinema.com. Stream on Amazon Video, FREE for Amazon Prime members. Buy the DVD on Amazon Prime with free 2-day shipping. We’re holding a giveaway contest for 2 FREE digital video rentals of ALTAR EGOS at ChristianCinema.com! So there will be 2 lucky winners, just in time for Christmas! Enter the Rafflecopter giveaway below. Hurry, contest only runs through the end of 12/21/17. *Must be 18 years or older, open to residents of the US only. This giveaway is in no way endorsed, affiliated, or associated with Facebook, Twitter, or any other social media networking site. Giveaway ends at 12:00 AM MST on 12/22/17. Winner will be notified by e-mail. Only one entrant per e-mail address, per giveaway, but there are multiple entry options in each giveaway and you may do as many of those as you wish. If you won a prize from this site in the last 30 days, or if you won the same prize on another blog, you are not eligible for this giveaway. Winner is subject to eligibility verification. Subscribe to the Homeschooling Teen e-zine, follow us on Twitter, and/or “like” us on Facebook so you won’t miss any upcoming announcements. DISCLOSURE: We watched an advance screening of Altar Egos for the purpose of writing this review.